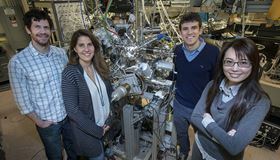 The Berkeley Lab research team – (left to right) Chris Jozwiak, Alessandra Lanzara, Kenneth Gotlieb and Chiu-Yun Lin – standing next to the SARPES detector. Photo: Peter DaSilva/Berkeley Lab. In the 1980s, the discovery of high-temperature superconductors known as cuprates upended a widely held theory that superconductor materials carry electrical current without resistance only at very low temperatures of around 30K (or -243°C). Since then, researchers have been mystified by the ability of some cuprates to superconduct at temperatures of more than 100K (-173°C). Now, researchers at the US Department of Energy's Lawrence Berkeley National Laboratory (Berkeley Lab) have discovered a clue to cuprates' unusual superconducting properties – and the answer lies within an unexpected source: the electron spin. The researchers report their discovery in a paper in Science. Every electron is like a tiny magnet that points in a certain direction. And electrons within most superconductor materials seem to follow their own inner compass. Rather than pointing in the same direction, their electron spins haphazardly point every which way – some up, some down, others left or right. When scientists are developing new kinds of materials, they usually look at the materials' electron spin, or the direction in which the electrons are pointing. But when it comes to making superconductors, condensed matter physicists haven't traditionally focused on spin. The conventionally held view was that all of the properties that make these materials unique were shaped only by the way in which two electrons interact with each other through what's known as ‘electron correlation’. The research team led by Alessandra Lanzara, a faculty scientist in Berkeley Lab's Materials Sciences Division and a professor of physics at the University of California (UC), Berkeley, used a unique detector to measure samples of the exotic cuprate superconductor Bi-2212 (bismuth strontium calcium copper oxide) with a powerful technique called SARPES (spin- and angle-resolved photoemission spectroscopy). In doing so, they uncovered something that defied everything they had ever known about superconductors: a distinct pattern of electron spins within the material. "In other words, we discovered that there was a well-defined direction in which each electron was pointing given its momentum, a property also known as spin-momentum locking," said Lanzara. "Finding it in high-temperature superconductors was a big surprise." In the world of superconductors, ‘high temperature’ means that the material can conduct electricity without resistance at temperatures that are higher than expected but still extremely cold, far below zero degrees. That's because superconductors need to be extraordinarily cold to carry electricity without any resistance. At those low temperatures, electrons are able to move in sync with each other and not get knocked by jiggling atoms, causing electrical resistance. Within the special class of high-temperature superconductor materials, cuprates are some of the best performers. This has led some researchers to believe they have potential for use as a new material for building super-efficient electrical wires that can carry power without any loss of electron momentum, said co-lead author Kenneth Gotlieb, who was a PhD student in Lanzara's lab at the time of this new discovery. Understanding what makes some exotic cuprate superconductors such as Bi-2212 work at temperatures as high as 133K could make it easier to realize a practical device. Among the very exotic materials that condensed matter physicists study, there are two kinds of electron interactions that give rise to novel properties for new materials, including superconductors, said Gotlieb. Scientists who have been studying cuprate superconductors have focused on just one of those interactions: electron correlation. The other kind of electron interaction found in exotic materials is ‘spin-orbit coupling’ – the way in which the electron's magnetic moment interacts with atoms in the material. Spin-orbit coupling was often neglected in the studies of cuprate superconductors, because many assumed that this kind of electron interaction would be weak when compared to electron correlation, said co-lead author Chiu-Yun Lin, a researcher in the Lab's Materials Sciences Division and a PhD student in the Department of Physics at UC Berkeley. So when the researchers found the unusual spin pattern, Lin said that although they were pleasantly surprised, they still weren't sure whether it was a ‘true’ intrinsic property of the Bi-2212 material, or an external effect caused by the way the laser light interacted with the material in the experiment. Over the course of nearly three years, Gotlieb and Lin used the SARPES detector to thoroughly map out the spin pattern at Lanzara's lab. When they needed higher photon energies to excite a wider range of electrons within a sample, the researchers moved the detector next door to Berkeley Lab's synchrotron, the Advanced Light Source (ALS). This is a US DOE Office of Science User Facility that specializes in lower energy, ‘soft’ X-ray light for studying the properties of materials. The SARPES detector was developed by Lanzara, along with co-authors Zahid Hussain, the former ALS Division Deputy, and Chris Jozwiak, an ALS staff scientist. The detector allowed the scientists to probe key electronic properties of the electrons such as valence band structure. The scientists conducted tens of experiments at the ALS, which involved connecting the SARPES detector to Beamline 10.0.1 so they could access this powerful light to explore the spin of the electrons moving with much higher momentum through the superconductor than those they could access in the lab. This confirmed that Bi-2212's distinct spin pattern – called ‘nonzero spin’ – was a true result, inspiring them to ask even more questions. "There remains many unsolved questions in the field of high-temperature superconductivity," said Lin. "Our work provides new knowledge to better understand the cuprate superconductors, which can be a building block to resolve these questions." Lanzara added that their discovery couldn't have happened without the collaborative ‘team science’ of Berkeley Lab, a DOE national lab with historic ties to nearby UC Berkeley. "This work is a typical example of where science can go when people with expertise across the scientific disciplines come together, and how new instrumentation can push the boundaries of science," she said. Using a supercomputer, scientists have managed to produce an accurate model showing how superconductivity develops in cuprates. The strength of a particular chemical bond in cuprates influences the temperature at which they achieve superconductivity. Ultrathin superconducting film from woven nanowires.